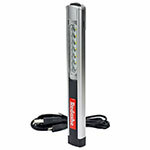 These bright two-in-one pen lights are perfect for a whole host of environments. The main light delivers 140 lumens and the handy end torch has a 70 lumen output. The lithium-ion rechargeable battery delivers up to 2.5 hours of operation. Light up your work area with the 90 degree functionality of the floodlight. This pen light comes with a USB cable for recharging, which takes approximately 2.5 hours.